We try very hard to use herbal remedies in our home, but plastic pill bottles still squeak in from time to time. I HATE tossing things and I consider myself rather skilled at discovering new uses for old things. There is a chance I’ve morphed into a upcycling addict. Oh well, there are worse things. 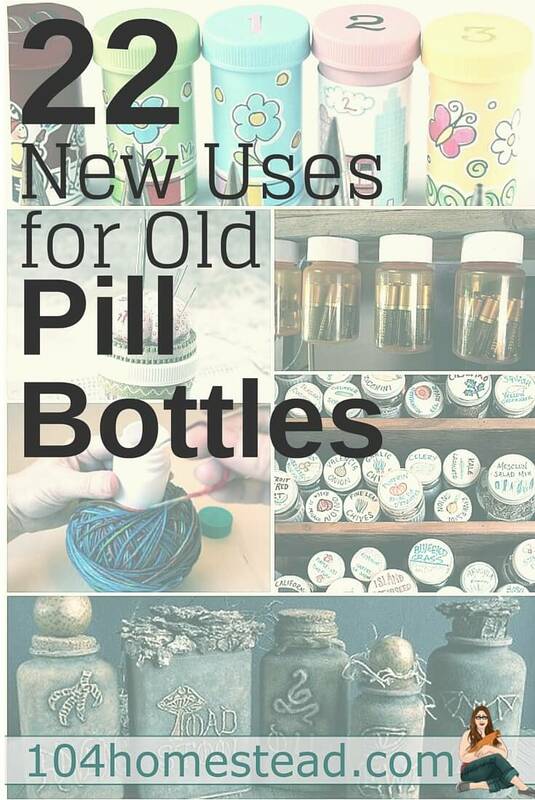 So with a huge stash of pill bottles needing a new purpose, I hopped on Pinterest to get some ideas. If you’re not following me on Pinterest, you really should. As always, click the image to get the tutorial for making these awesome upcycles. Image courtesy of Mom With a PREP. You can create fire starters with them. I’m not sure I’d get my kids involved (we have some “rambunctious spirits), but maybe for responsible kids. You can make a hide-a-key. I saw a similar one that used a pine cone. Image courtesy of Maddee Shaw Beauty Blog. You can use pill bottles to store shampoo, conditioner and lotion when traveling. I think these are the right size to be approved by airline security. Image courtesy of Tuscan Rose. You can make a travel sewing kit with attached pin cushion. Image courtesy of Survival at Home. You can make your own pill bottle survival kit. My husband has made about 20 of these and has them everywhere he spends any time. Image courtesy of The Bearfoot Baker. You can store small craft and hobby items, such as cake piping tips, small beads, and needles. Image courtesy of Magia Mia. You can make cute Halloween potion bottles. Image courtesy of Crafting a Green World. Maybe Halloween isn’t your thing and you’d prefer a winter snowman? You can make fun rainbow crayons. You get 2 “upcycle points” if you are upcycling broken crayons (another thing I refuse to throw away). You can make a faux bamboo vase. Image courtesy of Who Knew Tips. You can make one of those quick nail polish remover tubs. You can store ammo in them. I know nothing about hunting, but I’ve heard that dry ammo is happy ammo. Image courtesy of I Always Pick the Thimble. Okay, knitters and crocheters will love this one. Make your yarn balls center pull using pill bottles. No more chasing balls of yarn everywhere. Image courtesy of Scrapbooking 24-7. You can make your own ink daubers. I’m not sure what one would do with an ink dauber – BINGO maybe? – but it looked like a cute idea. Image courtesy of WDW Prep School. If you’re having trouble finding a place to store all your quarters (I’ve never had that problem), you can use them in a pill bottle. You can make some cool amber-colored party lights. Maybe for a doctor’s graduation party? Image courtesy of Chasing Green. Image courtesy of About: Family Fun. You can help out the Tooth Fairy by giving her something a bit bigger than a tooth to look for in the mess of bed sheets. You can store tiny hair doodads in them. You can lock up your q-tips so your children don’t attempt to clean each other’s ears – yes, it’s happened. If my DIY Printable Seed Packets weren’t for you, you could store seeds in them. Last, but not least, you can use pill bottles to organize batteries. If you’re crazy about upcycling like I am, you should check out Craftsy. They offer all sorts of online classes including my personal favorite, Project Upcycle. Want to donate your empty pill bottles? 12/01/15 Update: The Malawi Pill Vial Program “has proven the most successful program in our 22 years in Malawi,” reports Richard Stephens, one of the co-founders and member of the Board of Directors for the Malawi Project. He is making reference to the recently concluded pill container collection program conducted by the Malawi Project. Stephens continues, “The original Facebook post reached 5 million people, and churches, schools, and other civic groups all over the nation picked up the story. By late November the number of vials received had passed 1 million. More people have participated in this single program that any other program since our beginning in 1993.” The program concluded the end of November, with all final shipments to be sent to the Project’s offices between January 1st and 15th. What great uses have you come up with for old pill bottles? Share in the comments below. And remember, health doesn’t come from plastic bottles, but if it does, make something cute with the bottle afterwards! The crayons really don’t make a good burning candle, it will snuff out quickly. I add 1 part candle to 3 parts soy wax. It makes a crayon colored candle AND burns good. i find an old pill bottle is excellent for storing spare change in my purse. i carry the smallest bottle i had, which is just big enough to put a quarter flat inside. i don’t even bother to use the child proof cap, but the regular one, but i do have a pocket the bottle sits it. might be different if it was floating around in the bottom of a bag. what makes it especially convenient is i can see thru the sides whether or not i have the right amount of change. i don’t have to dig thru it or pour it out first. I donate to my local Vet. He uses them for Pet Meds. This saves him (small office) money. I have used pill bottles for gifts, especially fragile things. I wrap the item with cotton or tissue paper and put in bottle. Then wrap the bottle. I’ve been using them for all sharps, however, I use duct tape thoroughly around several times, so that if dug up, it will be extremely difficult to unwrap, & injuring someone. I also write NO!! on the bottle before & after taping it. HTH!!! Blessings!!! The one with the .22 ammo is dangerous, you dont store something like that with the tips of the projectile against the primer of another especially a rimfire, you drop it and can go off and if the bottom one will fire into the primer above etc, not smart. That is not true, you can take .22’s and throw them as hard as you want against anything and they will not fire. If you dropped a box of 100 into a fire, they would not shoot, the reason being the lead would melt long before the casing would heat up enough to ignite the gunpowder. Plus your “theory” doesn’t hold water as Reminton sells a small bucket that’s called “Bucket O’Bullets” with 1,400 loose shells. Unfortunately, they do go off in a fire, have had some accidentally get into trash barrels. We have the bigger pill bottle in our auto glove compartment to put the extra salt and pepper in . They always give to much at the drive thru or none at all. regarding the survival kits, I use lint from the drier inside a toilet paper roll rather than cotton to start the fires while camping. little too big for pill bottles, so I use a plasreneetic container or ziploc baggies. I “soak” (coat, really) cotton balls in Vaseline and put them in the pill bottle for fire starters. The Vaseline will burn long enough to get your fuel ignited. I can see a good combo here with the long in TP tubes, as well! I use one to put a roll of postage stamps in and then have it in my purse. I always have stamps available and I don’t have to worry about them coming off the backing and sticking to everything in my purse. Our homeless shelter also uses them for medicine for the people that require it there. I always carry a large empty or two for my used insulin pen caps, lancets, and test strips. It’s safer for everyone. When I get home, I transfer from bottle to sharps container and put the bottle back in my travel stuff. We also donate extras to our local animal shelter. We use our old pill bottles for toothpick holders, extra allergy tablets (still in each package), Tums, Aleve, etc. placed in each vehicle’s glove compartment that way we don’t have to move back/forth to the vehicle being used. I have also put baby diaper rash medicine, mentholatum or salves, then label with sharpie pen. In my sewing I use for holding my extra machine bobbins, carry thread & needle if taking along for mending or hand quilting. Also misc. parts such as flat washers, sorted small screws or nails for tool boxes. Our local drugstore is currently collecting them for a local organization that is collecting as part of a project. what’s the easiest way to remove the label from a prescription bottle? Soak in water, scrape, then use goo gone to remove the sticky. WD-40 sprayed on those labels rub it alittle let sit a few minutes. Then it’ll come right off! Easy Peasy! I use my hairdryer to remove sticky labels from almost anything, even other labels, like markdowns. Warm setting, start on one corner and keep pulling as you heat the label. No residue. Use equal parts coconut oil and baking soda. Peel off label or as much as you can. Rub mixture on remaining label and gooey sticky stuff. Let set for several minutes. Then wipe off with paper towel. Works for jars and bottles too. Learned this method from a post on Pinterest. Use your hair dryer to”warm” the label, just start at one corner or side and start to gently pull on the label as you warm it, never any residue from the adhesive. Hand sanitizer gel will remove the label and the stickiness. Pull as much as you can off, then run under some water. Lastly, run a film of mayonnaise over the remaining label or adhesive, set aside and it should be ready to just peel off in a couple of hours. Number one use as important as keeping meds out of small kids hands……. Use to lock up lighters, matches! And maybe those tide pods from the little kids. I’ve got 0 ideas with pods and the teenagers! I use them to make toys for my cat. After I clean and dry them out, I put a bell or two in a bottle and my cat loves it. I also have put coins in them as well. I’ve also put catnip in them and poked holes in the lid and my cat goes crazy. I put cotton balls in them for med.cabinet or purse with astringent in one.I put my pills for the day in them.I hate fishing hooks put them in fishing gear so no getting stuck.you can also put mouth wash in a over night bag or purse. I put cat or dog treats for rewards. Enjoyed the site very much. I keep wanting to figure out how to chip these, melt down the chips and mold them into bricks and planks. DIY FURNITURE! To add to “ideas for upcyle pill bottles” for smokers, or for friends of smokers to give to the smokers: to use to put their cigarette butts in, instead of throwing the butts on the ground to throw in the garbage later. Cigarette butts are the #1 littered item in the WORLD. Our local animal rescue shelter accepts them for their animals. I take a sack of empty, clean, and devoid of labels every month so so. How do you remove the labels ? Fill with hot water and they come right off. Start peeling the label off the vial in the bottom right hand corner. Less pressure is used the when putting the label on the bottle. If you’re having trouble getting it completely off use a lighter to re-warm the label and it should peel right off. I use them to store my beads that I use in jewerly making as well as small jewerly findings. Keeps my craft space nice and neat. I’d avoid repurposing them for traveling, especially with liquids since they will leak. If you put a solvent in one, it’ll evaporate quickly for the same reason. Very true! I’ve been in that situation with my son’s medications. You have to be very careful with controlled medications especially. Carry the tag/receipt from when you get from pharmacy. They will even give you a spare label if you ask. This has been wonderful as we only carry a day pack on trips. Actually, it depends where you live. In Florida, we have some *very* liberal laws regarding non-labeled meds. As long as you have a label on hand, like in your wallet or purse, you can use it to prove any Schedule II medicine is yours. Ask the pharmacy to print you a copy when you pick up the pills. Explain you need it flat, just for back-up, so they don’t stick it to another bottle. You will need a fresh label every time you get a new rx, usually monthly. Schedule II medicines are ADHD meds, strong painkillers, things like that. Your pharmacist can tell you what classification any pill you get belongs in. As a side note, be extremely cautious when dispensing anything from this category, especially if giving to a minor or elder. They are potent, often dangerous drugs, and should be used with respect for their power. OTOH, sometime it’s all that will work. There you have it. When in doubt, as your pharmacist about rules & regulations to do with your specific medication. I adore all these wonderful ideas for upcycling this extra plastic in my home! I make a “Get Well Basket” which includes some containers filled with different candies, goodies, etc and give to the sick person. Candy for a sick person will only keep them sick. Just saying. After you make an EDC/survival/fishing/sewing kit out of a pill bottle, wrap several feet of duct tape around the outside. I can’t leave my house without duct tape! I like to use mine to put my daily meds in after I have taken them out of either the original bottle or the daily containers. I have little ones that sidetrack me easily. This way they never get left anywhere unsafe or forgotten cause I couldn’t take them at the exact moment I pulled them out. I have sensitive skin so holding my pills hurts my hands and this fixes it. Also we use them for myy husband to keep extra pills in at work. If he misses a dose it causes some big problems so this helps a ton. Also we use them for my husband to keep extra pills in at work. If he misses a dose it causes some big problems so this helps a ton. WARNING: Nail polish remover will eat through a pill bottle! Sewing machine needles are different sizes & tips for different fabrics. I store them by size & type, & label the pill bottles accordingly. When I change needles for my machine the bottle caps are reversed to show which needle size is in use. No more guessing or searching for a magnifier to read the tiny imprint on each needle. BIG time saver! corn cob holders, which keeps them clean and prevents getting stabbed when hunting for them in a drawer. My sister, a talented sewist, stores spools of thread with their matching bobbins in empty prescription bottles. No more time wasted “matching” or looking for one or the other because both are housed together. A label on the bottle or cover indicates the thread color inside. Works for me! Thanks for all the great hints. You could put a hole in the cap and a wedge cut in the cap to see the color before opening. I use them for “female discretion” ….. They are the perfect size for keeping OB tampons clean in your purse . Hi, I absolutely love your ideas. I mentioned you in my blog at lupuscrazy.com. I wish I was as clever and creative as you. Thanks Stacey! I really appreciate it. Went to the hospital recently and brought a bottle for each morning I would be there, filled with lemon juice and a few drops of stevia. Added to warm water, it was an easy way to keep up with my morning lemon water habit without the hospital kitchen being confused by such a request! Also, I keep my lip balm tube in one in the car so, even if it gets hot and melts, the mess is contained. Several other uses that have already been mentioned here (earrings when traveling, buttons in my sewing kit, etc.). I’m interested to try the idea of earbuds in one, in my to-go bag when I go to sell my plasma (which takes an hour.) Thanks for the inspirations! We use old pill bottles for weights and hooks for fishing. The battery-storage idea really caught my attention because it’s so important to avoid letting the ends of one battery touch and drain another new battery! FYI – nearly all the caps have a liner which can be popped out and used solo, thereby making the bottles easier to open and reducing space needed for putting a bunch of bottles together. I use old pill bottles to keep earrings or other jewelry in when travelling. I’ve wound skeins of embroidery floss around them after untangling them. I have pictures on my blog of how I use the bottles for thread holders. Works great no more tangled thread. All of them are great ideas, but storing your ammo is not a good idea unless you transfer the lot number from the manufactures box to the inside of the bottle. This number is very important to keep up with the recall of ammo if that happens. I use a pill bottle for salad dressing in my lunch bag. I buy herbs in bulk and store in pill bottles. Also handy for spices and herbs to take camping. I use them for storing push pins, safety pins and sewing needles and other small sewing notions. My name is Xiomalis and I live in Miami, FL. I use empty pill bottles and vitamin containers of various sizes around the house and garden. In my office for stationery items: paper clips, push pins, split pins. In the shed for saved seeds. In my sewing room for pins, needles, hooks and eyes, safety pins, snap fasteners, buttons (especially sets, or grouping different kinds together). In my art room/studio for paint, bits and pieces for collage, pva glue when the large bottle gets nearly empty (much easier to get the last out). In the laundry room for odd buttons that come off in the wash. My husband uses them in his workroom for any small bit that need to be kept together: same size nails, screws, nuts and bolts, and rawl plugs for fitting into plaster walls. Plus many of the above ideas for travel kits for first aid, sewing, and even for the original purpose, medicTion to be taken on a specific day when I am away from home. Since I use them to store change in my car I also use one for wrappers from gum candy and snack bars. They were always in my cup holder and ending up on the floor. Now I fold them up small to store in the pill container until full. Then empty and reuse. Loved some of the ideas! My husband and I both (unfortunately) take multiple medications which results in too many pill bottles! I remove the labels and take them to my veterinarian. He takes wonderful care of our pets while trying to keep prices down! Saves him a little $ and makes me feel good about not adding to our land fills! Check with your/a veterinarian! I use them in my tool chests to hold small items such as my counterbore bits. Good hardware, screwdriver bits, and such storage. I use them to keep small items in my tackle box. I also used one to make a snail trap for my aquarium. i use one in my purse to hold my ear buds for my phone, i can always put my hand on the bottle and they stay cleaner. I store tall skinny makeup items such as eye liner pencils, makeup brushes, even lip balm sticks in larger Rx bottles without the cap to keep it visible and organized in my makeup box (which is a plastic shoe storage tub, again without the lid). I’m a quilter and I use pill bottles to store used seeing machine needles. This way no one gets stabbed. Use them to store birthday candles, that way they won’t break when they’re rolling around in the junk drawer! ?? I use them for cat treats, especially when going to the vet! I grew up on a 160acre homestead in Alaska. We found many uses for our pill bottles. We would roll up our dollars and save them until Christmas. There were seven kids. It was a competition to see who would save the most. We also put safety pins in them. We were always popping off a butter or ripping out a seam. We use them for our quarters and pennies for the penny press machines at WDW. We stack four quarters and one shiny penny and continue the pattern until the bottle is full. We also have an empty bottle for the pressed pennies. No more loose change or lost penny treasures!! We also use them for quarters, but for penny press machines at WDW. We stack four quarters and a nice shiny penny and continue the pattern ’til the bottle is full. We also have an empty one for the pressed pennies. No more loose change or lost pennies. My fishing tackle bag has lots of old pill bottles. I started using them for lures with hooks in them. I also put sinkers, loose hooks and other small tackle bag items in them. They are also great for carrying dish soap, mustard ketchup etc on picnics, camping etc. I have ideas for many uses. But, my tackle bag was the first. I use pill bottles to put my used lancets and strips in when I check my blood sugar. The bottle fits in the pocket of my meter case and when it is full, I tape the lid shut and throw it in the trash. Just FYI, there is a huge fine for throwing needles in the trash even in a container. They should be disposed of at a facility that takes sharps. The fine is like $20,000.00. It depends on your location. Here in PA, we are told to place sharps in a plastic container, seal with tape, and dispose that way. In Illinois, we can throw them in the trash, too. I was surprised, also, when I had to give my cat IVs and I started calling around to find out what to do with the used needles. The police department, city building and county building didn’t even say anything about putting them in a container (although I did, anyway)! This is s great idea. I can never find s trash can when I need one. And also I don’t have to worry about anyone else getting stuck. I was collecting my pill bottles for donation to the Malawi Project, but I missed the donation window. I’ve yet to find another place to take them, but I would think there are others out there. If someone finds a charity to take them, please post the info. If I hear of another, I’ll add the information here. I would like to know too. I have a lot. Thank you. Clean, empty pill bottles with labels removed may be sent to Matthew 25 Ministries, 11060 Kenwood Road, Cincinnati, OH 25242. I found this organization after learning that the Malawi Project is no longer accepting bottles b/c they have received over 2.5 million of them. Thank you for sharing this. I was sad the other program closed down, but glad it was because so many people donated. Do ALL of these so-called links link right back to YOUR pinterest instead of linking to the actual sites you took the images from? Poor form. They go to pins on my Pinterest boards because people notoriously delete pins and that would cause a broken link. Not poor form, just making sure when you click on a link it doesn’t leave you in “oops, that pin no longer exists” land. When you click on the pin, it takes you to the person who wrote the tutorial (and whose photos I was given permission to use). I use one to carry mixed nuts to snack on when I’m at work. I’ve used old pill containers to keep change for parking meters in my car. I’ve found that they work great for that. I tried using pill containers to store batteries once. It turns out that it’s not such a good idea. The alkaline batteries couldn’t “breath” and chemicals leaked out into the air-tight container, They were ruined, and caused a mess. It was basically a waste of good batteries. Oh no! That’s the first I’ve heard of that happening. Just so you know……daubers are little ink holders for crafting cards. Roll up some sponges and insert in various types of holders to make your own. Good idea! Use one to carry extra earrings and/or pins while traveling. Also for mixing watercolors or acrylics in larger quantities than practical on a palette. I use them to carry extra earrings when I travel. I also use them to mix paint when mixing colors in a larger quantity for a painting. we make what we call “shakyshakies” for our special needs granddaughter, who loves to have something in her hand to shake and make noise. We put small not so noisy beads inside and then cover them with material so they won’t accidentally come open. I don’t know how old your granddaughter is, but if she is old enough for something larger, by far the best bottle I’ve found for shakers is an empty “POM Wonderful” bottle (as a sports, juice, or energy drink, they are a bit pricey, but for a toy or sensory object, the empty bottle is great). I use the tiny size or the medium size (which is a small soft drink or water bottle size); the largest size is too big. Yes, there is writing on the bottle, but with a little effort, if you want a clear bottle, you can get the writing off with Pro Strength Goof Off which you can find at a hardware store. I like these bottles because of their unique shape and because, if you close the lid real tight (like with pliers), you don’t have to use something to seal it, although an extra cautious person might hot glue it closed. (I don’t like using material around something if you have a kid who puts their everything in their mouth, such an item might roll around on the floor, and having no material on it will make it easier to clean. “Profoundly normal” toddlers love these shakers too and no batteries needed – great to sleep with and no annoying kid music, which can get old after a while. They also make great maracas for a rhythm band instrument for elementary kids. I peel off the labels, the sticky residue left behind is easily removed with taking the peeled label and using it to remove the sticky stuff left. Just take the sticky side of the label and use it quickly to pick up the sticky stuff. Good tip to know. Thank you Judy! I love all these ideas posted! I use them for my super glue and just add tiny broken pieces that need to be glued on. It is the longest my super glue has ever lasted. I also use them for thumb tacks and other sharp things in my junk drawer. I covered a strand of white lights with them with labels attached and hung them as an Over-the-Hill party decoration. For the same party we made up funny ‘prescription labels’ and filled them with candy and such and then put them in white paper bags (like those you get at the pharmacy) and glued small logos like ‘Rite Age Pharmacy’ on the bags. It was tons of fun and everyone loved the decorations. I am now getting ready to sort some ‘out-of-control’ sewing supplies using them. They are perfect for my scrapbooking embelishments I will be using in the scrapbook at hand. I use them for dental flossers and keep in my car or when traveling. These are some great ideas! I use some of mine for earbuds, q-tips, laundry quarters, gum, tooth flossers/picks, nail clippers,and other little items. I also save them for the local vet to use. I think it is a great idea to re-purpose various items. I also use them for storing wood matches along with the strip on the side of the box to start the match….zippers don’t always work!! I use to live in the Northeast and carried an emergency preparedness kit/plastic bin in the car just in case I got stuck in snow, ice, mud…whatever, and this came in handy along with other things I had for those “just in case” trips!! I also buy the larger economy size bottle of Excedrin migraine med and put them in a smaller bottle for the car. Very helpful when sitting in traffic. They’re also good for carrying small candies for quick low blood sugar fixes until you can get something more solid to eat. Something else we do with them is to make peel & stick labels for every day of the week times 2 for my dad’s meds. We line them up on Sunday…usually…then fill each one with all the meds he’s going to need for each day….MORNING AND EVENING. Then we put 7 in a small plastic container for the morning and another one for the evening meds. Extra tip…..the A.M. meds container has a bright yellowish orange lid for daytime…YELLOW FOR MORNINGS….and the evening meds lid is red…RED FOR BED. Makes life LOTS easier for all of us and the confusion over WHICH med to take WHEN is 100% eliminated!! EVERYBODY’S HAPPY!! I usemineforcamping, putting wooden matches in to keep dry. Save them,spray paint with green, red and or white and make a Christmas Tree!! Love these ideas. I use mine for seed saving. Sharing! Also works with salt, sugar, or powder creamers…. Congratulations! You had good ideas! I liked and shared them with my brazilians friends! 2 ideas: I sometimes have trouble sleeping without earplugs. When I travel, I put them in a pill bottle so they are easier to find and don’t get squished or dirty. Second, at Renaissance Festivals they sell qhite expensive little metal bottles to fill with ice and put in your cleavage to help you stay cool. A pill bottle would be great for this in summer, Fest or not! The cleavage suggestion has to be the best suggestion ever offered. Brilliant! Yes,brilliant. Can’t wait to try this one out. I’m in AZ and some of my relatives and friends are in FLA. I can’t believe I’ve never heard of this!! !l So cool! Facebook post: Pill bottles: they are those translucent orange soldiers that pile up all around us… in our drawers, bags, cabinets… sometimes I wonder – if I had saved every empty pill bottle since I got sick, what would that look like? One of the things I have always hated the most about being sick, is you often need more help than you can give. That’s not always true, but there are definitely days or weeks like that for even the most functioning among us. I see those specials on tv and think: I want to build a Habitat for Humanity house or dig wells in Africa (this might be a late night, insomnia induced thought but the general sentiment still stands). “Medicine Bottles for Malawi” is a project with an idea so simple, it’s brilliant. I’ve tried this myself so I can vouch for how easy it is to do and how good it feels to pass on something you know will help others. Imagine you’ve walked miles to a remote village or hospital to receive any form of medical care you can find. You are given the medication you desperately needed and now you have to start the journey back home. You don’t shake the pill bottle maraca as you walk because there is no pill bottle, heck there’s barely medicine. The pills you received are wrapped in a tiny scrap of newspaper. Take your meds and when you finish the bottle, don’t throw it away! This includes bottles you might receive over the counter like for Advil, Motrin, vitamin bottles, supplements – as long as the bottles aren’t large, send them on! (Large bottles just cost too much to ship). I find it’s easiest just to peel them off, takes a few seconds, but you can also save up until you have a pile of the bottles and dump them into a bowl of boiling hot water. I used a large flat manila envelope, it’s cheap & easy to mail. Tip: Take a photo of that ^ address on your phone & save it as a contact! When you have enough bottles to send off, you won’t have to log back in here to find the address. I do this often and it definitely saves some energy to take photos of info. I saw someone online arguing that we shouldn’t send them to Malawi because they won’t be recycled when they are finished being used. I thought this question was silly since they are so desperately needed there but I like the answer all the same: Nothing goes to waste in Malawi. Your medicine bottle, when it’s empty, will be used in 100 other ways. Imagine you have very little and then think of all the ways a bottle with a sealed lid could be helpful. The medicine bottles we don’t need or want anymore, that probably lie around in drawers reminding us we need that medicine to begin with, to someone else, it’s a gift. What better way to use a little bit of energy and send them on! I use the empty bottles to hold items such as small screws, nails, brads, nuts, bolts, etc. I didn’t read all the posts, but I have donated mine to the local animal shelter. They need them for doggie/kitty medicines. I just remove the labels. Our animal shelter is always in need of pill bottles for stool samples to go to the vet’s office. you can use the taller ones to carry tampons in, roll up a pad in another, taller ones good for gum sticks too, any size for single round peppermints. its great for in the purse, so they dont get ruined by something. I put my toothpicks in them. The toothpick boxes are always falling apart and make a mess in the kitchen drawer/cabinet, depending on where they are kept at the time. So I stick them in pill bottles. I can get a whole box of 250 into one of the short, fatter kind of pill bottle. Smaller bottles can also be kept in your purse, travel kits or car. That’s a great idea. We get the toothpicks that come in packets of 200 in little paper bags. The seams always tear and I end up with toothpicks all over the drawer. The real bummer is when they get caught along the drawer seams. I will have to start storing them in pill bottles instead. The toothpick holder is also an excellent idea to store toothpicks in our camp trailer, my dad always kept sinkers, swivels and fishing hooks in old pill bottles for his fishing tackle box.. that way, if the box tipped over, the sinkers, swivels and fishing hooks didn’t go everywhere! 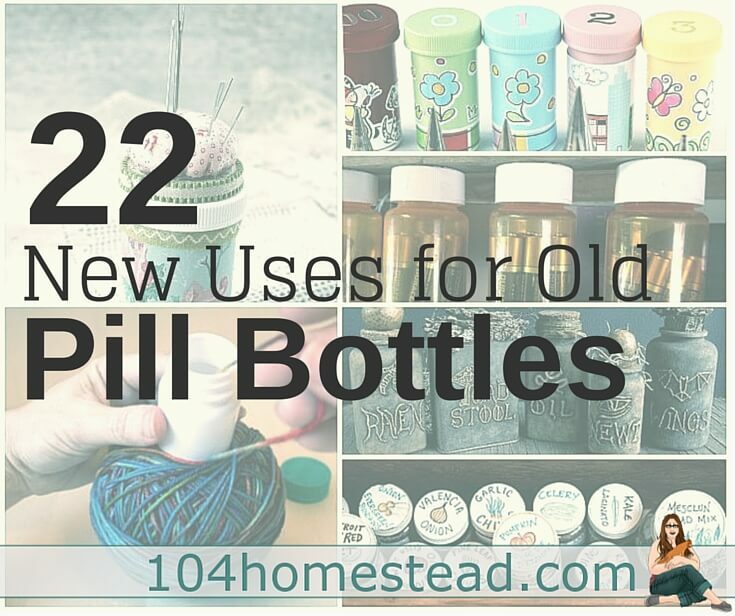 I have an obscene amount of empty pill bottles that I use for numerous things in my craft room, but there are a couple things they can be used for that I didn’t see mentioned. For one…when storing nails or bobby pins, glue a small magnet to the inside lid. They will adhere to it so you don’t have to dig your fingers into the bottle. Also I keep a medium sized one in my purse to put straw/candy wrappers, and other small trash in. Keeps your purse tidy! I use a empty pill bottle as a expedient sharps container for my diabetes testing supplies while camping/traveling. It works until I can get to a real drop off point or return home. I have pill containers that are white, not amber or opaque. Are those containers acceptable to your project? I will be saving mine in the future. Thanks for saving the pill bottles from going into a landfill. Those ones work great as well. Love the post! I think you could use pill bottles for a crayon holder ( glue a couple bottles together an put crayons in it). I used the pill bottles to store my loose drill bits, etc. I also use them to put nails or screws that I have left over from projects. Baby food jars are perfect for this as well! U can even screw the top of the jar under a shelf then screw the jar in! U can see everything in the jars and u also make use of the bottom of the shelf! Love your story! I use mine for all kinds of things, including holding plastic grocery bags. One will scrunch up in a pill bottle nicely for camping, glove box, etc. Learned this from GeoCachers! That’s a great idea. I love geocaching. I haven’t been in forever. I’ve seen where people make a small fishing kit to include in their shoebox for Operation Christmas Child. I have found old pill bottle make excellent cases for those pesky headphones that are always somehow getting themselves all tangled when left to their own devices. Those daubers are perfect for card making, art journaling and other paper crafts. Use them to apply inks and paint. They sell similar “finger” daubers for this. Thanks for the idea! I do a lot of crafting & have a hard time finding storage. I took an old tool box (just tall enough for the bottles to fit in) & put buttons in them & hot glued a button on the top so I’d know which button is in the bottles. Another thing I saw using old pill bottles is. Drill holes in them all the way around, in any where doesn’t have to be a pattern, and then fill the bottle with moth balls and hang in your apple trees to keep the deers and other animals away. That’s a great idea. It would keep pets and children safe while keeping the tree safe. Brilliant! Here is the address for the collection of empty pill bottles. Labels removed and clean. Great idea for schools or scouts to get involved too. Thank you so much for sharing the address with us! i use pill bottles to put my ear buds in so they don’t get tangled in the car or glove box. Works well. I also use for bobby pins and clip pies when I travel. I emailed her earlier today to get the address. If she gets back to me, I’ll email the address to you and be sure to add it to the post. Thanks! Some of the people in our church are saving them. We have an address for a place in Indiana that will send them to medical missionaries in Malawi. Sometimes they don’t have anything to put the medicine they give the people….only wrap it in a piece of paper. That’s where we are sending ours. My dad used both pill bottles and baby food jars to sort/store nails and screws. He would attach the lids to a board, fill with nails or screws and attach the whole thing to his garage walls (like shelves). My husband does something similar. Pill bottles are great for storing floss sticks in my travel kit. i use them to keep mints and sugars in for my car and purse. I also use them for condiments in lunch bag. if you get a tall one, they are perfect for tampons and short ones for pads, so they dont get a mess on them in ur purse. TOO funny, worrying about the kids and the pill containers ! Where was everyone when gummy vitamins became the new normal? Gummies aren’t really safe candy for very small children, and now if they get a vitamin bottle open they could eat 50 vitamins yikes. Gummies nor Gummy vitamins come into my house. You have a really good point. My 3yo daughter ate half a bottle of gummy vitamins once… 3 days after she ate a whole tube of chapstick. .. poison control must think we’re nuts here! She was fine both times- they have to eat an obscene amount to even have a chance at causing issues but still! I use the pill bottles to store my seeds of flowers and vegetables. I wrap masking tape around the bottles, and the seeds are in the dark and I can write the name of the seed and the date. Sorry for my bad english writing. I’m a french canadian friend of Québec and I don’t master english perfectly. Greetings! Hello neighbor! Your English was fine 🙂 That is a wonderful idea for saving seeds. I might have to try it. My toddler ripped open and dumped all of last year’s seeds. Child-proof caps might help keep them safe. I made up some of those smoothie straw spice holders. I had all these straws that were around 3 inches long and wanted to keep them separated by salts, peppers, Italian seasonings, etc. I painted some of my old pill bottles and labeled them. Then I put them in my bug out bag in the event we have to leave the house. If I don’t use them by summer I will be using them for camping. I have an extra large pill bottle that my reading glasses fit into. Keeps them from getting scrunched in my purse. I have literally hundreds of these!!!! My workshop, crafts, sewing and more. I refuse to just throw them out! Anybody need some? Use the lids that have side splits (cvs). weave ribbon/string into the splits to make a necklace then decorate the tops. makes medals for kids that do not look like medicine. That’s a great idea. My kids love stuff like that. My favorite use for medicine bottles is the following: Hubby drilled a tiny hole in the lid and I drop used sewing machine needles in the bottle. When I get a few in there I just throw away the bottle with no worry about someone being stuck. I use my husband’s empty insulin test strip bottles to store small items. I have been using my old pill bottles for years to put rocks, beans, rice etc in side and glue the top on just to be on the safe side of things….and have made stuffed animals and put a “SHAKER” on the inside…small children love these…even my crocheted animals have them…..like my snake has a “RATTLE” on his tail……….now that i have read this i can use these bottles for so much more!!! Thank you. Love this idea!! My playful little weenie dog will too! 😉 Thanks so much! I use one for used and broken sewing machine needles and straight pins. I store my wound bobbins in one too. A great way to remove the labels is to put some water in the bottle and microwave it for 15-20 seconds. Use caution removing from the microwave. The water will get hot enough to loosen the adhesive and the label peels right off!! My girls used to love playing with my good lipstick. I put them in pill bottles and now they’re safe!!! I use pill bottles to store my tapestry needles. They are also good for small quantities of beads. I have recycled so many of these. Guess I will start to collect them again. Good for those who do crafts or scrapbook to store all the bling. i use a couple of big ones to hold my edc, with hair elastics, duct tape and dental floss on the outside. i also have no small humans, so i get the airtight regular caps. you could store just about anything in these puppies. Great idea using the outside of the bottle as well as the inside. I buy seed beads in bulk and use/label old pill bottles for storage. An old shoe box can hold quite a few of them and if you label both the cap and the bottle, it is easy to tell what you’ve got by lifting the lid of the box. I need to take some time to do that. I’ve got loads and loads of seed beads in plastic envelopes and they always manage to pop open. How funny that I’ve been saving the little “power bait” containers and not the Rx containers…. Am beginning today for seed storage. I have many containers from the in home nurses visits while caring for my late great mother in law that I have used for envelopes of seeds. That changes this month! I’ve always thrown medicine vials away but since I’m 60 and my grandkids live on the Other Coast… yeah. I appreciate this. I don’t follow Pinterest but I Do follow Hometalk. don’t forget about them! Thank you for this Jessica! when storing buttons or beads in old prescription bottles………… you should glue a sample to the lid. Then you can see at a glance what’s inside. These are some great ideas! However, I can’t agree with putting anything edible in bottles that have stored prescription medication, and definitely not giving the edible stuff to others. I am probably paranoid, but these days, you just don’t know what may leach into or out of something. I use the pill bottles in weaving: broken warp threads can be threaded through the proper heddles and then put into the pill case with a proper amount of weight (creating the proper tension). These then just hang at the back of the loom. That’s a great use. I don’t weave yet, but it’s on my list of things to learn. I agree with some of the previous commenters. Pill bottles should never be upcycled for anything having to do with children, most especially to hold candy! When I had small children at home luckily there were still camera film containers that could be upcycled. Pill containers should only be upcycled for adult purposes. Children should never think it is okay to handle or play with these Containers. Better safe than sorry!! I agree…..same as pet toys! It is NEVER OK to let pets think pill bottles are ok! I had a neighbor do that and eventually the dog got a bottle full of medication and chewed through it and DIED!!! I’m 14 and I was always told “never put candy in a pill bottle that looks normal” so much the snowman idea and the Halloween idea would be great. Some clever ideas here, however, NEVER put candy in a pill bottle. I, sadly, have to take a number of prescription meds. I get the snap-on caps rather than the screw-on ones because there are no small humans in our home. I suppose you could use this tip for either type of cap, though. Punch a number of small holes in the cap. Fill the clean canister part with powdered sugar. Put on the top. Instant shaker for baked goods! Just a tip for you, psiamiam – and for anyone else: If you flip the white screw-on cap, it is no longer childproof, so for people who prefer not to have to fiddle with the little tab – and don’t have vulnerable people in the home – it’s an alternative to getting the snap-on version. Also, once you flip the tops, pill bottles stack better. I don’t have any younglings in the house so used the snap-on covers. When I changed pharmacies, they used the screw-on ones. I didn’t like it when you flip those covers so I just used my toenail clippers to cut off the protruding thing in the bottle. The pill bottle is obviously the film canister of the 21st century! Nice post! I used a larger pill container to put my contact case in for traveling – they always leak a little. The smaller ones are perfect for folding up a plastic grocery bag in – much neater that way and you can have a few in your purse or car for that trip to Aldis! I have some tall ones that I have made nail kits with. I put a metal nail file, a few cheap emery boards, (because they are small), large and small nail clippers, cutical scissors and I also put in tweezers. I keep one in the car and one in my purse. They come in so handy. I use them for my thumb drives for my computer. Just print a mailing label to tell what’s on the drive. #6 never use them for candy, if there’s any chance a child can see it. Actually, just don’t do it at all. We have a 4 month old and a 16 month old. We have random items that make different sensory noises in old pill bottles EVERYWHERE. So rattles is my top! We did the same thing for our baby. We used pill bottles filled with different materials (such as rice, beans, bells, etc) to make different kinds of rattles. Then we sealed & decorated the bottles with colored and patterned duct tape. This is a great idea! I have a 19-month old. Thanks for the suggestion! A friend used them to organize her garage. She used them to keep nails, screws, etc. separate. She also used them to store small craft items. My husband does that. He also utilizes baby food jars for all the little tidbits. The small altar candles that come in glass jars with lids also work great for that. My daughter is always taking her ear rings off when she showers,leaving them on the bathroom sink counter. I keep a pill bottle on the shelf to put them in, it keeps them from being dropped in the drain. They work great for storing buttons. Why not use them for storing your spices when you go camping. I used to use old camera film canisters for camping spices but with the advent of the digital camera I have now run out. This is a great alternative. I use mine to store beads and small items for my crafts. I also use them to mix small amounts of resin for jewelry and accessories. sometimes I use them to ship small items in because they will be better protected than just an envelope and smaller than most boxes. Love the crayon recycle idea. I actually do that with left over resins. Makes cool barrel beads. I use mine for sorting and storing beads I have saved to make jewelry. I also sort colors and types of buttons, samples of fabric to match at the fabric store, sewing machine needles. I like the idea of using bottles for yarn and spices while camping. When the grandkids come to the beach, we could collect small shells and some sand. That’s a great idea. This is a creative and interesting blog post. Thank you for sharing your great ideas. I am off to find out some other ideas for recycling! A roll of quarters fits perfectly into a pill bottle. And I also put a roll of stamps in mine to keep in my purse. Makes it easier to find them. I love the stamp idea. We either can’t find them or our toddler finds them first and decides they’re stickers. Seriously awesome post Jess. I had a huge bag of these, which I recycled. My daughter used some when she had gestational diabetes and put the used needles in for disposal. I recently started saving them again. Like you, we don’t take a lot of prescription meds but they do seem to pile up anyway. I was trying to pick my favorite idea from the list but it sure is hard. maybe the cute little snowman? Could you still fill his innerds with candy? That’s a great idea! I’m not sure why you couldn’t. His little hat comes right off. How cute would it be to use them as little party favors for kids that come with their parents to holiday parties? It’s really not a good idea to put candy into pill bottles. Children can get confused candy with pills and the ends be disastrous. No matter how cautious you try to be there is always that split second, and no one wants to endanger a child. That’s quite a list. I saw the topic in my inbox and thought, “I can only think of one – firestarter kit. Wonder where that clever idea will be ranked.” Haha! These are very interesting. Do you have any other recycling crafts/ tricks? Thank you! I have hundreds, but the two I’ve posted include 16 New Uses for Old Bed Sheets and 10 New Uses for Old Greeting Cards.